My name is Toni and i’m born again and spirit filled. Let me start by saying that I have two wonderful kids that are learning about God and how much he loves us! My daughter Isabella, has a wonderful connection with God that makes me so happy! She is 8 years old right now but she started getting close to God many years ago. She has thrilled me by giving me messages from God and showing me the love that God has for us! The other day, my daughter came home after school and told me that she is making something on the paper and wanted to give it to me. I’m always happy when my kids make a drawing or write something for me, its very special! 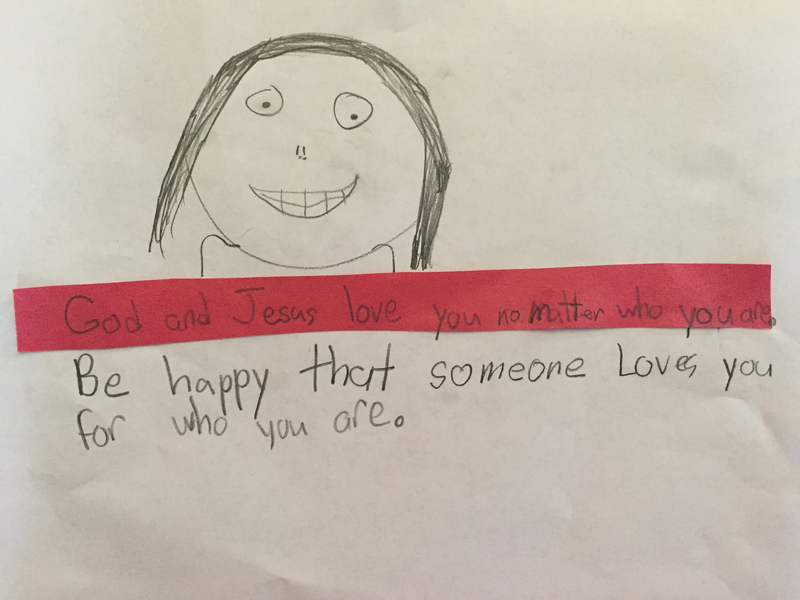 So, she gives me this paper and I read the beautiful message about God and I was just stunned! It said “GOD AND JESUS LOVE YOU NO MATTER WHO YOU ARE. BE HAPPY THAT SOMEONE LOVES YOU FOR WHO YOU ARE”..
DON’T EVER FORGET ABOUT HOW MUCH GOD LOVES YOU!! WE ARE HIS CHILDREN THAT HE LOVES SO VERY MUCH! WE ARE WORTHY OF HIS LOVE, NOT BECAUSE WE DID ANYTHING BUT BECAUSE WE HAVE FAITH AND BELIEVE IN HIM. ROMANS 5: 1-2… Therefore, since we have been justified through faith, we have peace with God through our Lord Jesus Christ, through whom we have gained access by faith into this grace in which we now stand. GOD BLESS ALL OF YOU! !